As “market referees”, regulators contribute to the delivery of essential public utilities. Their organisational culture, behaviour and governance are important factors in how regulators, and the sectors they oversee, perform. The OECD Performance Assessment Framework for Economic Regulators (PAFER) looks at the institutions, processes and practices that can create an organisational culture of performance and results. 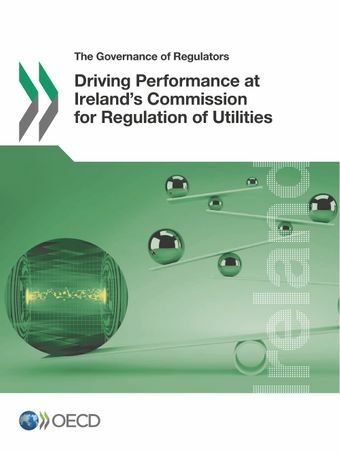 The report uses PAFER to assess elements linked to both the internal and external governance of Ireland's Commission for Regulation of Utilities (CRU). The review acknowledges the achievements and good practices put in place by the regulator since its creation. It also analyses the key drivers of CRU’s performance and proposes an integrated reform package to help the regulator prepare for the future. The Commission for Regulation of Utilities (CRU) is an independent multi-sector regulator with a range of economic, customer and safety functions and duties in Ireland’s energy and water sectors. The CRU is a high-performing and well-regarded regulator that has, since its creation in 1999, successfully absorbed new functions and developed and implemented major policy reforms for the benefit of Irish consumers and the country’s economy. As the regulator continues to implement complex projects in a rapidly changing and uncertain policy context, its institutional and organisational capacity to operate effectively needs to be bolstered through integrated reforms to upgrade some of its external and internal governance functions, including strategic planning and human resource management mechanisms. These changes and reforms are not “nice to have” improvements. Rather, they should be seen as a comprehensive and necessary reform package that will enable the regulator to enhance its performance, stand up to future scrutiny and ensure that the multiple challenges it faces are adequately addressed.